SoundRoots World Music & Global Culture: Kooza! Circus acts seem to be increasingly common these days. Even in my small city, one can often find a performance by gravity-defying fabric artists, or fire jugglers, or other such folks. Nonetheless, it's rare to have a show with the scope, size, and skill of Cirque du Soleil in the area, so I jumped at the chance to see the show Kooza under the big top erected at Redmond's Marymoor Park, just east of Seattle. Between traffic and negotiating the parking labyrinth, I ended up arriving late and missing the first act, but soon found my seat (a small seat overflowing with the thigh of a large neighbor) just in front of the sound engineer. With the relatively small space and 3/4 stage, there really aren't bad seats in the tent, and I was just as happy moving after the intermission to a neighborless seat in the back row. Ah, but the show. 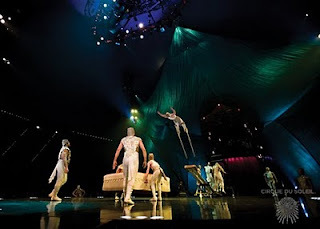 It's billed as a journey by a character known as The Innocent, who meets odd people and strange situations, but in truth the show is a rather loosely knit collection of classic circus acts including trapeze, high wire, juggling, balancing, clowns, contortionists and the like. It's tied together with some great music from a live band, who usually sat half-hidden high in the column forming the stage's backdrop. An Indian influence ran through some of the music, along with funk and other popular sounds. I wouldn't seek out the soundtrack for separate listening, but it was enjoyable during the show and the musicians were top-notch. 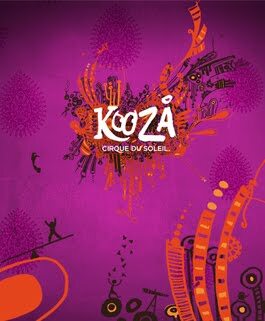 The name KOOZA is inspired by the Sanskrit word "koza," which means "box," "chest," or "treasure," and was chosen because one of the underlying concepts of the production is the idea of a "circus in a box." Along with the music, I particularly enjoyed the fantastic costumes, the clowns, the gravity-bending "wheel of death," the remarkable hula hoop woman, and the "teeterboard," an extreme version of the standard playground teeter-totter. People not only fly through the air, they do it wearing stilts. Do not try this at home. You'll probably also not want to try lying on the ground and running your feet around your stationary head, as one of the contortionists does. This and other moments drove home to me that the circus (just like professional sports) is simply the acts of incredibly focused, disciplined people who hone a narrow set of skills to the edge of what's humanly possible. Put simply, they're freaks. Freaks who move, bend, and balance in ways ordinary humans cannot. Which of course makes them highly entertaining. The show contains some dark moments and sexual/excretory humor, so be advised if considering bringing young children. But it's generally a show that has something for everyone, and I found it a delightful first Cirque du Soleil experience. I'm just glad I wasn't too close to The Bad Dog at a certain point in the show.